In His name: Thoth, Thout, Tetu, Techu, Zehuti, Tehuti, Djehuty. The Scribe of Ma’at. The Lunar Librarian. Lord of Divine Words. Creation’s First Storyteller. It can be purchased in paperback format through Amazon and Amazon.uk and Barnes and Noble. 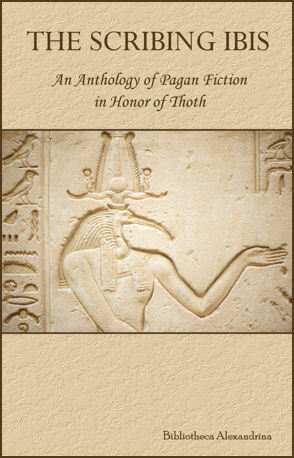 All of the proceeds from The Scribing Ibis – as well as many of the other volumes in the Bibliotheca Alexandrina series – will be used to help promote the revival of the worship of the ancient Gods, with a portion of the proceeds given to a worthy charitable organization in their name. So, not only will you be getting a wonderful book featuring stories about Thoth, Ker, Maaemo, Loki, Ares, Baron Samedi, and many others – but your money will be going to do good work and help the revival of ancient polytheistic religions. ATTENTION Librarians, Teachers and Retailers: The Scribing Ibis is also available at reduced cost for academic institutions, lending libraries (public and private) and retailers. Check our online store, or email baeditor@gmail.com with any questions.